Shipping cargo to or from Guam or Saipan? Meet your sea freight shipping deadlines with DHX - Dependable Hawaiian Express’ unprecedented cargo handling, great domestic freight shipping rates and industry-leading customer service. With an office conveniently located in Harmon, take advantage of our complete, customized transportation services including trucking, project cargo, container delivery, logistics, warehousing and more. Is your shipment LCL or FCL – different rates apply. What is your point of origin or ultimate destination? Are you using a motorized carriage or a (much slower) barge service? 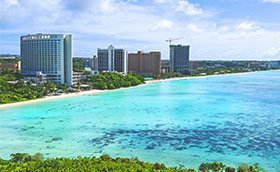 Do you need a reliable carrier with newer vessels who sail directly into Guam from the West Coast via Hawaii? Give our office a call today to find out the cost to ship to and from your favorite Guam or Saipan destination.